With Christmas just around the corner we're bound to be hosting many family gatherings as well as having friends over for company during the festive period. Not only do you want your house to be inviting for guests you also want it to be clean and tidy. One room many people often forget about or aren't quite sure how to make it more inviting is the bathroom! 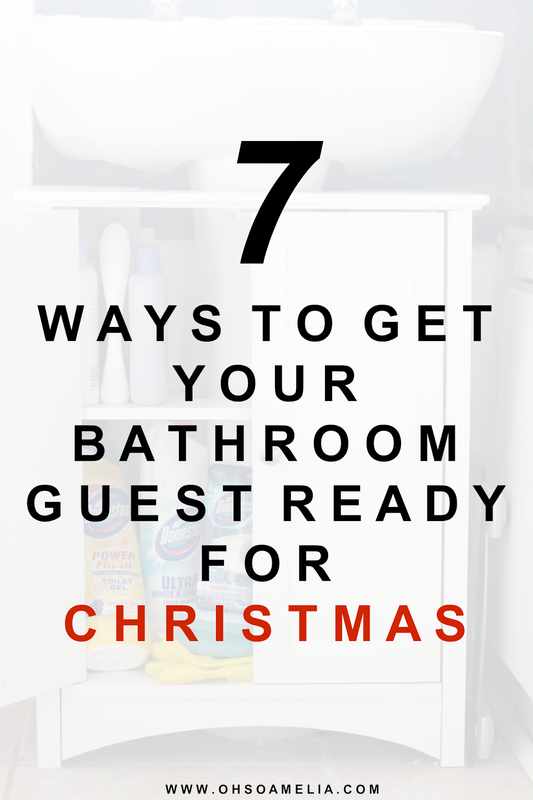 Here are my top tips to get your bathroom guest ready for Christmas! There's nothing worse than sitting on the toilet and doing your business then realising the last person to use the bathroom has used all of the toilet roll! Have some at the ready and easily accessible for your guests if they need it. 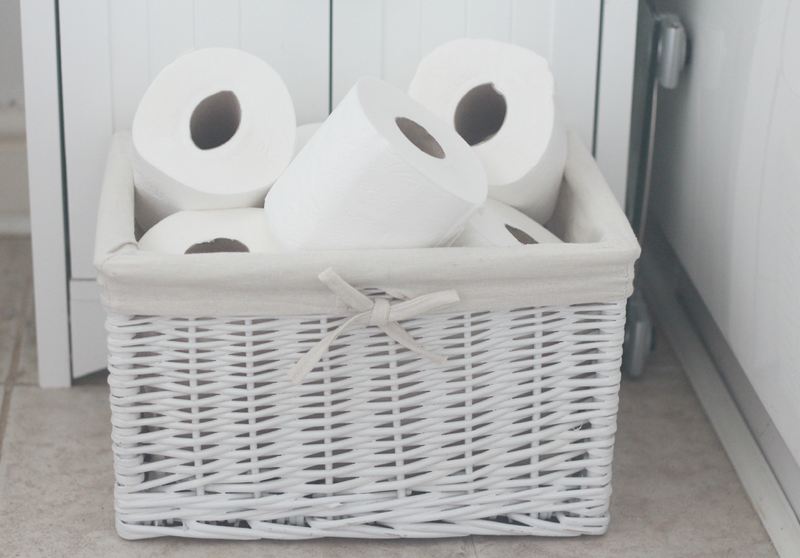 I like to have a wicker basket full of toilet rolls in arms reach of the toilet to avoid those embarrassing moments! 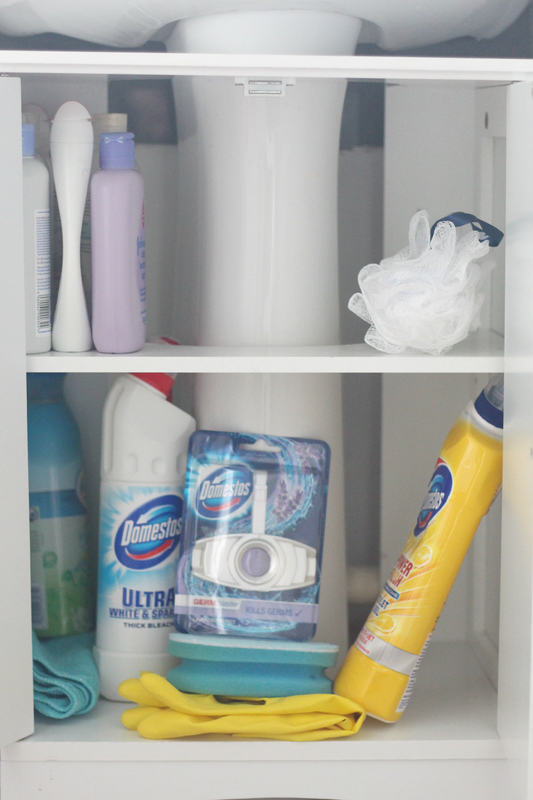 With guests coming and going it's a good idea to have a dozen or so hand towels at the ready stashed in your cupboard. You could have a small basket near the sink with a few in or if you have a towel rail make sure it's stacked up. Rolling towels up in a basket or on a shelf creates a hotel/spa feeling which is very inviting and calming. With many guests using the bathroom over the festive period we want the bathroom to be smelling as fresh as possible and for the toilet to remain clean at all times. The easiest way for this is to clean it with Domestos toilet cleaner first thing in the morning and also have a couple of Domestos Germ Blaster rim blocks in the cupboard at the ready to kill off any of those unwanted germs and keep the toilet looking and smelling fresh flush after flush. Invest in some storage such as a under the sink cabinet or a shelving unit with a cabinet to store away any cleaning products, toys and other bits and bobs to keep your bathroom looking uncluttered as possible. If you're going for a spa look this is the best solution and will keep your bathroom looking inviting at all time. Don't forget to use child locks or get a cabinet with a lock if you have kids especially if you're storing cleaning products inside. By burning a candle in the bathroom you will keep it smelling fresh all day round, you could use a Christmas scent so it smells festive. If you have young children then a plug in air freshener may be a safer option for you. To make the bathroom a little more inviting how about adding some greenery or flowers. As it's Christmas perhaps a mini Christmas tree or some festive flowers. I like to have a couple of plant pots with artificial plants such as succulents and then in the winter I can switch them around. You may end up having some guests staying the night at last minute who wouldn't have brought any supplies such as a toothbrush, flannel, soap, or shower gel. It's a nice touch to have some bathroom supplies to help them freshen up a little in the morning as well as before bed. I like to create space in the cabinet for a basket full of some cheap toothbrushes, a couple of flannel and some little bottles of body lotion, hand wash, shower gel and shampoo & conditioner. These are usually bits I've taken home from hotels or samples from magazines so instead of throwing them away keep them for instances like this! So those are my tips on how to get your bathroom guest ready over the Christmas period, do you have any tips to share? Great tips, I think it's always good to make sure your bathroom is guest ready. Couldn't agree more about making sure there is enough toilet roll. Some fab tips here. I always make sure to have plenty of toilet roll no matter what! Great tips. We just stocked up on toilet paper buy I still didn't get time to clean the toilet. I have to replace the hand towel actually. Thanks for reminding me. Nobody staying over in hours though. Some great tips here. Espeiclally having plenty of toilet roll and hand towels. Nothing more embarrassing than someone going in and having nothing to use. Love the candle idea as well. Thanks for sharing. Hi there! This article could not be written any better! Reading through this post reminds me of my previous roommate! He continually kept preaching about this. I'll forward this post to him. Pretty sure he'll have a very good read. Thank you for sharing! iMessage for PC, iMessage for Android Before that, we should merely take a snappy diagram of the iMessage application.